What's up all, new member here, figured i would introduce myself . Newish to the motorcycle scene, rode my buddies sportster last summer and fell in love. 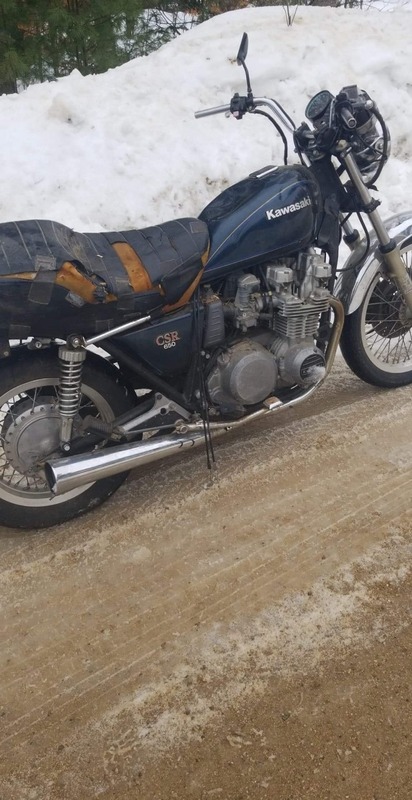 So here I am, around 8 months after and just picked up a 1981 kz650h from a neighbor, for the grand total of 100$ I didnt do bad, was missing the throttle and the spark plug wires were junk, also some bend handle bars and just overall neglect, but fairly "clean". Welcome! I usually say if you don't have pictures it didn't happen Ha Ha! and of corse O hope you have all the correct tools like jis screwdrivers and the like along with the Kawasaki shop Manuel you can get off ebay most everything you can get from z1 enterprise. or z1 parts. Expanded pictorials and parts can be acquired through Partzilla .com. With a new bike It is a good idea to absolutely know what your sitting on, myself I don't trust other mechanics you don't know to see if it will stop.